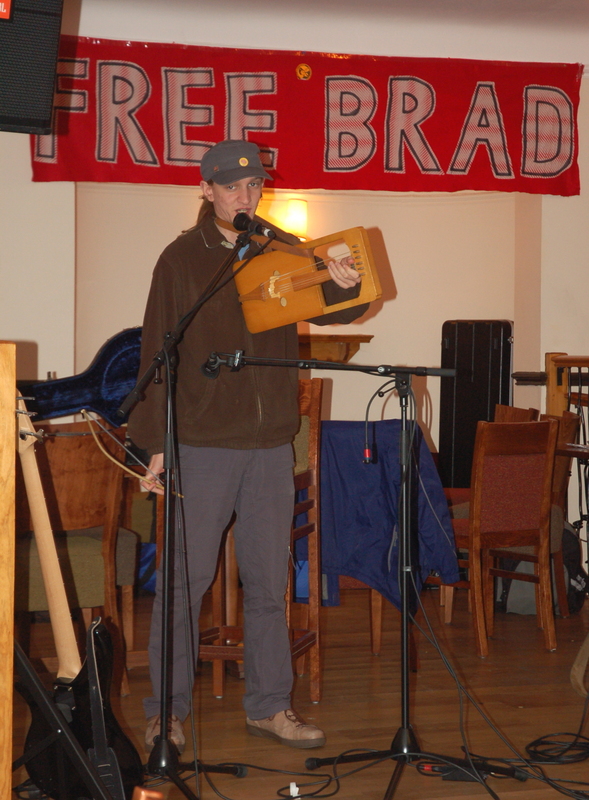 A series of free events have been organised by a group of supporters of the 24 year old accused whistleblower with Welsh roots (Bradley’s Mum is Welsh and he lived in Wales as a teenager), coming together as ‘Bradley Manning Support Events’ within the network ‘WISE Up for Bradley Manning’. 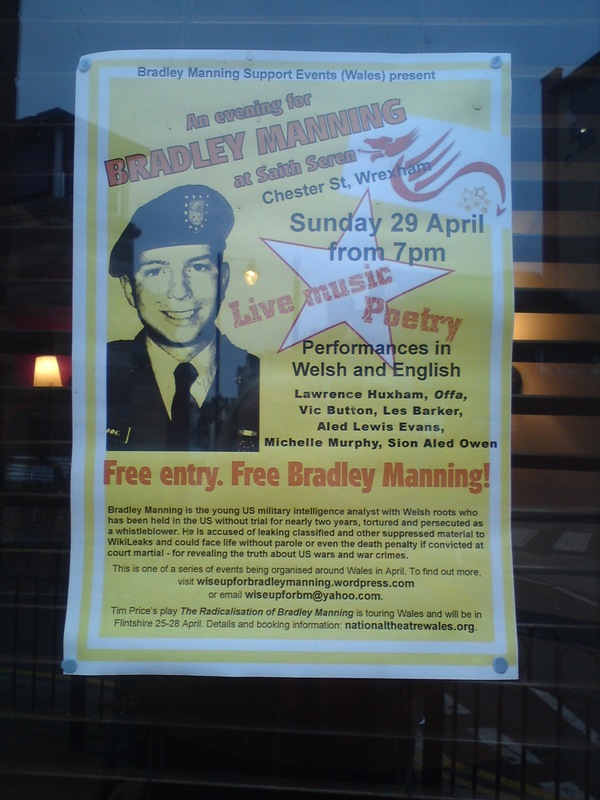 The events, which have included meetings, speakers, film, discussion, stalls, art and performance, have taken place in Pembrokeshire, Cardiff and north east Wales at the same time as Tim Price’s play ‘The Radicalisation of Bradley Manning’ has been performed by National Theatre Wales in these areas and live-streamed to the world. 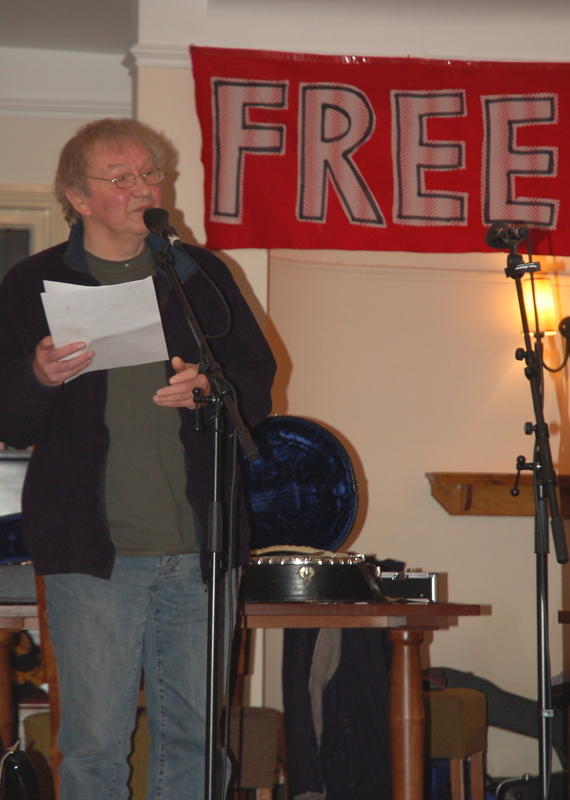 The Wrexham finale featured an eclectic mix of music, poetry and prose in English and Welsh. Young Welsh singer-songwriter Lawrence Huxham who plays the cittern as well as the traditional Welsh crwth was MC for the evening. This song explains about the life of Bradley Manning when he was in Wales before moving to the American dream where he was then in the army of the stars and stripes. Then he moved to Iraq where the awful war has happened, when Washington’s lies covered up how many lives were lost, how many innocent people have been killed by American soldiers. Bradley finds out what happened to people, then he was held and taken to detention and was tortured. Everyone is sad and worried and asking Washington to release him. 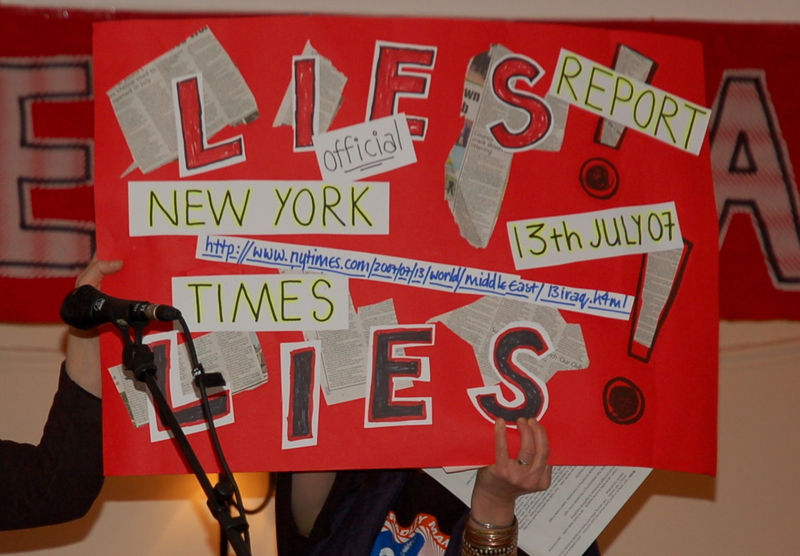 If the Welsh-American society believes in peace, then my message to Washington is: ‘You have been lying about the reality of war in Iraq while Bradley Manning is standing up for the truth. I don’t want to fight you but to persuade you to give freedom to Bradley Manning. 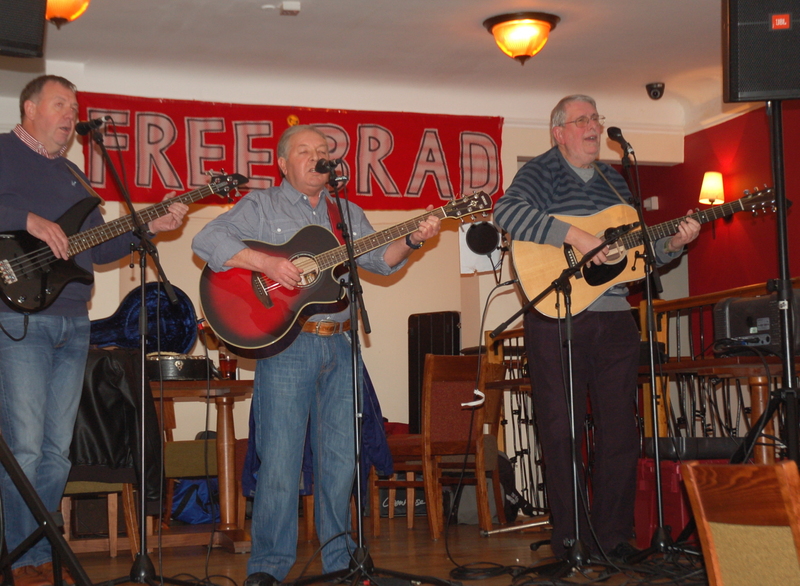 Local folk band Offa who run the Nags Head Folk Club in Wrexham had carefully chosen and rehearsed appropriate songs for the occasion. 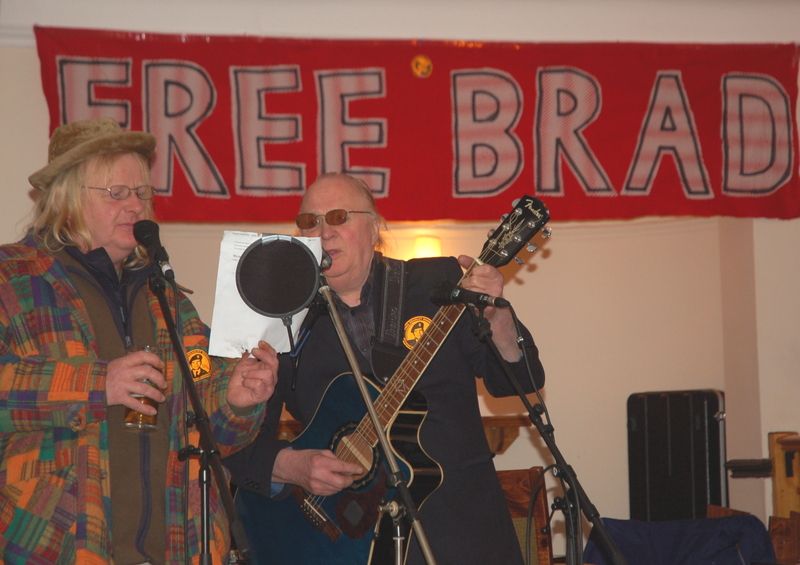 Vic Button’s set included Pete Seeger’s ‘Where have all the Flowers Gone?’ and Leon Rosselson’s ‘The World Turned Upside Down’ which he sang with Frank Bowman. Hazel Ogden, who stepped in at the last moment, sang one of her own songs ‘Walk/Run’, then gave a moving rendition of Buffy Sainte-Marie’s song ‘Universal Soldier’ that looks at the responsibility we all hold for the wars that are fought in our names. 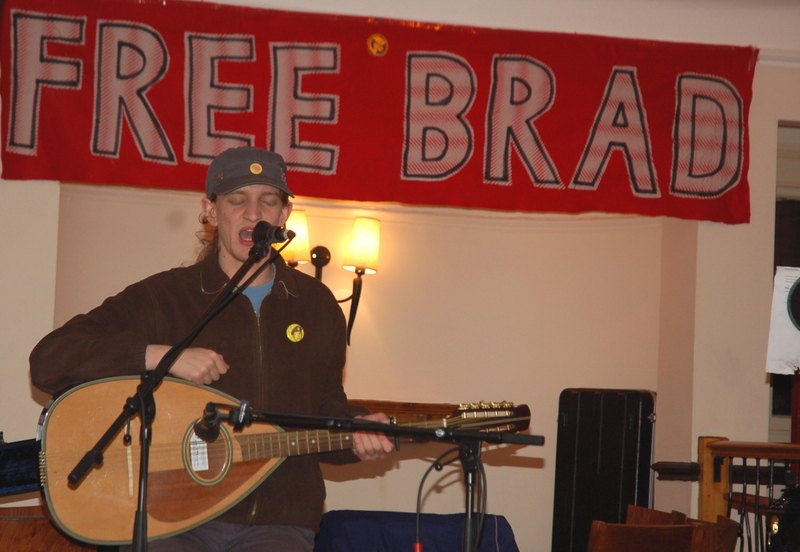 The song starts with the line “He’s five-foot two… He’s six-foot four.” Bradley Manning is five-foot two. Aled Lewis Evans read two monologues from his book Driftwood, the characters being, in the first story, an anxious Welsh mother whose son Gareth has joined the army, and in the second, a piece entitled ‘Bridge Building’, one of Gareth’s neighbours. Siôn Aled Owen read his poem ‘Telling Tales’, pointing out the cultural barriers to whistleblowing at all levels, and another inspired by a play on the word ‘Brad’ that translates from the Welsh as ‘Treason’, introducing the idea that it could be considered treason to stay silent in the face of wrongdoing. un o rai sy ddim yn rhydd. one of those who isn’t free. 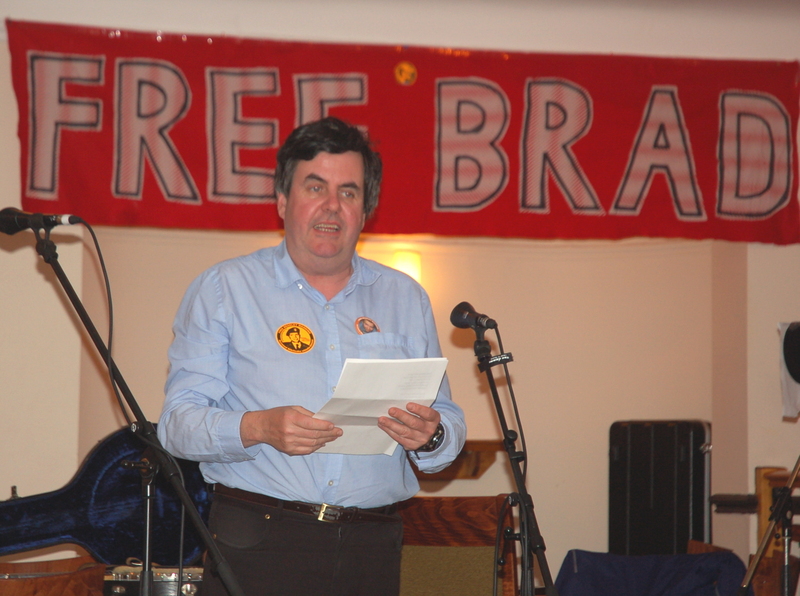 Other poems performed by Les included one with the ink still wet on the page, called Low Hanging Fruit or ‘Thank You Tony Blair’, written in response to the trial and conviction of Charles Taylor at the International Criminal Court; a poem about the USA [English version: Liberty’s Beacon; Welsh version: Ffagl Rhyddid]; and this one from 2004 about the ‘War on Terror’: The Civilised World. 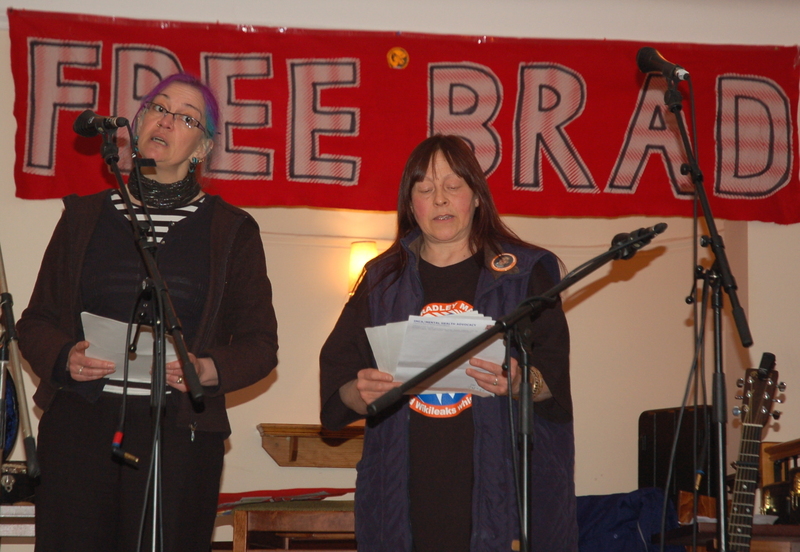 Lindi Carter and Bridie Przibram read extracts from the online conversations reported to have taken place between Bradley Manning and Adrian Lamo, the computer hacker who handed him over to the authorities. Entitled “Bradley Manning: ‘In his own words’,” the extracts focus on Bradley’s motivation for leaking the documents and video and his hopes that the leaks would bring about change for better in the world. 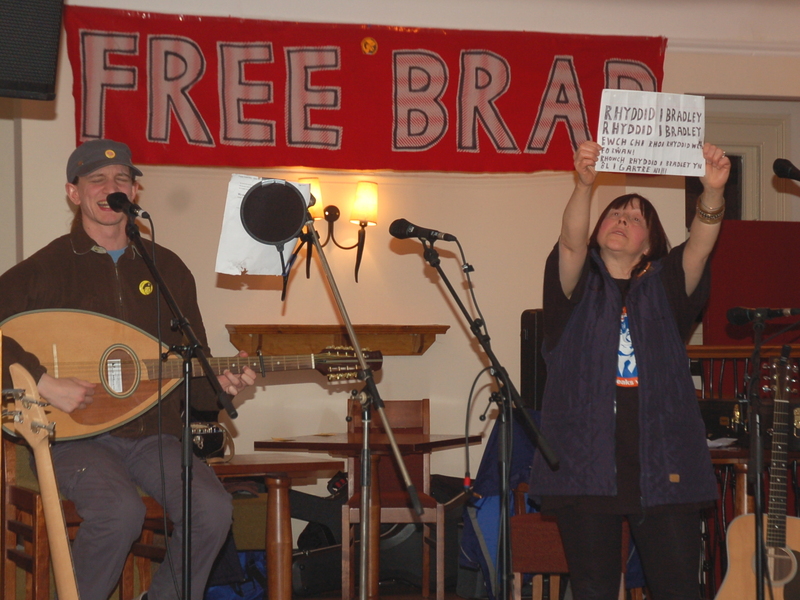 The evening concluded well after closing time with a second rendition by Lawrence Huxham of ‘Rhyddid i Bradley” for which the remaining audience stood as a mark of respect for and solidarity with Bradley Manning. We very much hope that other individuals and groups across Wales will find out more about Bradley Manning and take action in support and solidarity. 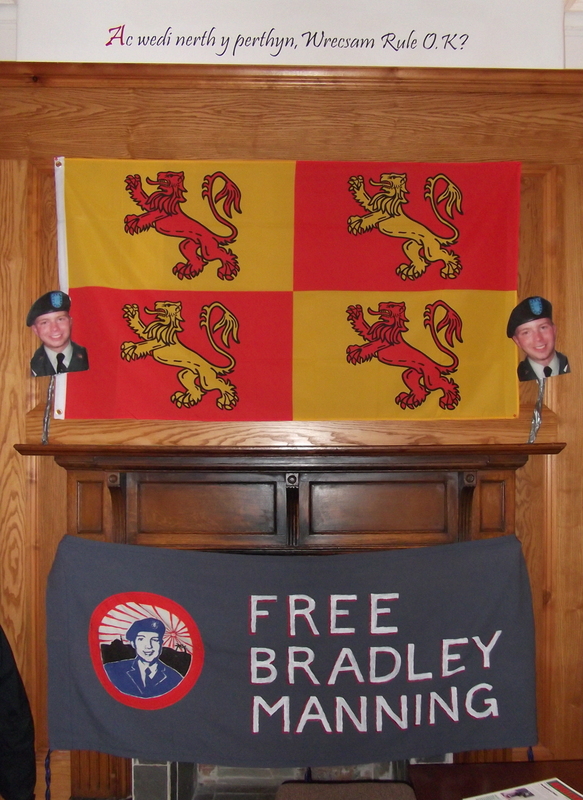 A collection of letters written to Bradley over the past few weeks by Welsh well-wishers, along with a donation to his defence fund will be sent to the US shortly. 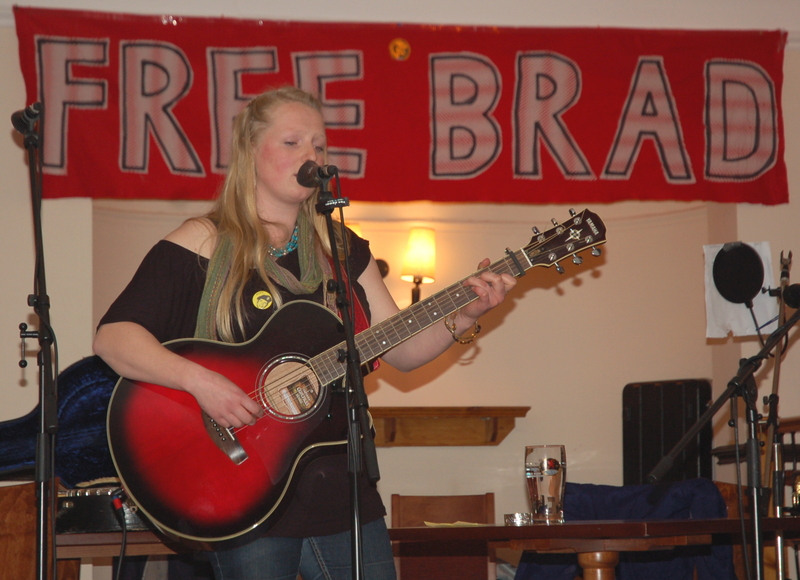 The WISE Up for Bradley Manning network can be contacted on 0845 330 4505 or at wiseupforbm@yahoo.com. Donations to support solidarity actions can be made via the website. 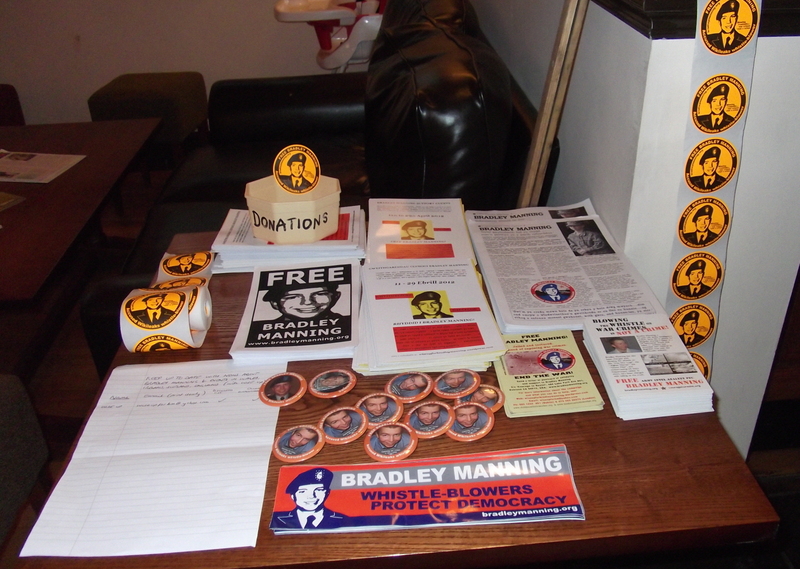 For the international campaign for Bradley Manning, see bradleymanning.org. 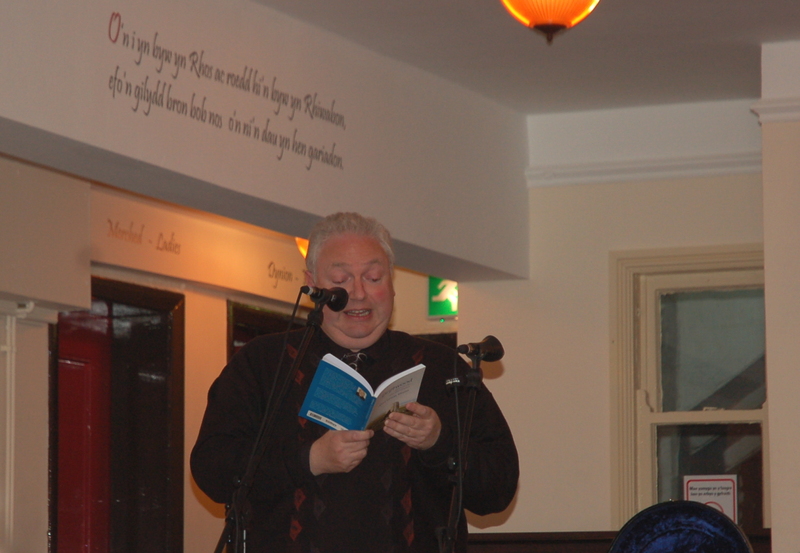 More photos from the WISE Up Tour of Wales here. Bradley Manning is the young US military intelligence analyst with Welsh roots who is accused of leaking hundreds of thousands of documents and other files to WikiLeaks. He has been held without trial for nearly two years, for nearly a year of this time under tortuous conditions which have drawn criticism from many quarters including the UN Special Rapporteur on Torture. Although he has yet to be tried for the alleged crimes at a military court martial, President Obama, Commander-in-Chief of the US military, has already declared him guilty. WISE Up for Bradley Manning (WISE = Welsh, Irish, Scottish, English). The WISE Up network calls for all charges against Bradley Manning to be dropped and for his immediate release.